It's finally getting into the "bitter cold" temps in Texas, which is bringing the scarves and winter jackets out of our over-sized storage units. But while you might be a little colder than normal, please, whatever you do, don't get a Necky. 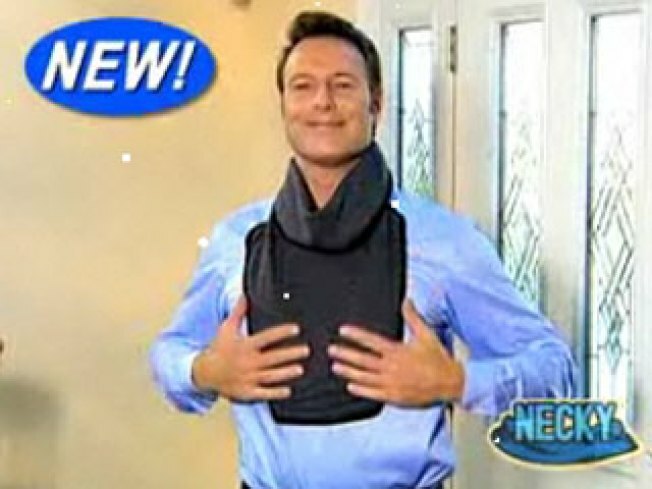 As you can tell from the Snuggie rip-off commercial above, this Snuggie rip-off combines the best part of Velcro -- it's easy to take off and put on -- and the worst part of a turtleneck -- the fold-over neck that makes you look like a undersea tube worm. Honestly, if you need a Necky, you need to have a reality check. Sure, you could get a leopard print Necky and look like a spotted idiot, or look like a real knockout with a classy scarf. It's products like this that have that "I never knew I needed that" quality that tickles our anger bone. If you needed a way to keep your neck warm, wear a turtleneck, the aforementioned scarf, or just zip up your coat. Even the commercial shows folks with hooded coats using the Necky to keep warm...someone is trying very hard to make something from nothing. But let's get to the real heart of the matter; the Necky is anti-fashion. In the three bland styles, there might be some way to combine it with something you'd actually want to wear, but why would you? As soon as you take off the coat, you've got a piece of fabric Velcro'd around your neck, blocking the neckline of your real shirt and showing off your decision to wear what amounts to a giant bib out of your house. Planning to just wear it outside? Go ahead, flip up that collar and you'll be ready to mug any old lady you see. Use her purse to buy another set of Neckies and you'll have your weatherized gang ready to rob -- and ready to show off your bad fashion sense. Thanks to NBCDFW's Omar Villafranca for finding this Horror of Fashion.